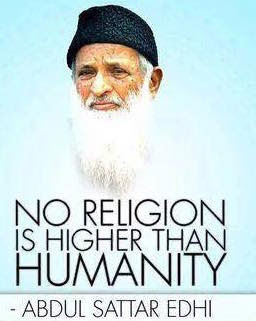 Edhi understood the meaning of what the Quran, the Muslim holy book, says in chapter 2 verse 177: "Righteousness is not that ye turn your faces towards the east or the west, but righteous is, one who believes in God, and the last day, and the angels, and the Book, and the prophets, and who gives wealth for His love to kindred, and orphans, and the poor, and the son of the road, beggars, and those in captivity; and who is steadfast in prayers, and gives alms." Edhi's foundation served all in need. When he was asked why he thought it was okay for his ambulances to pick up Christians and Hindus, he said, "Because my ambulance is more Muslim than you." Edhi was 88 years old when he died Friday night in Karachi, Pakistan's largest city. He had been ill for weeks, and had needed a new kidney, but he refused all offers to go abroad for treatment as Pakistan's elites often do. Pakistan's Prime Minister Nawaz Sharif recently underwent heart surgery in a London hospital. Edhi saw how the religious leaders of the Muslim majority in Pakistan focus mostly on Huqooq-ul-Allah (prayer, fasting, hajj, etc) while ignoring the equally important Huqooq ul Ibad (rights of fellow humans and all of Allah's creation). He realized the urgent need to bring the two in better balance. He did so by caring for the poor and the needy who felt abandoned by the Pakistani state and society. "It is everyone's responsibility to take care of others, that's what being human means. If more people thought that way, so many problems could be solved," he reportedly told the BBC. Edhi started his work with a single clinic in 1951. Then he established Edhi Foundation that is now the country's largest welfare organization. It runs schools, hospitals and ambulance services across the entire length and breadth of the country, including remote places where there's no sign of the state. Edhi was everything Pakistan's leaders are not. He did not take money from the people to stash it away in foreign bank accounts. Unlike the country's politicians, bureaucrats and generals who take everything they can for themselves, Edhi gave everything he had or collected from the people to those who needed it most. Unlike the country's politicians, bureaucrats and generals who live extravagant lifestyles in luxurious mansions, Edhi was known for extreme austerity. He wore simple clothes and lived in very basic housing. There has been great outpouring of glowing tributes to Edhi, including those from the nation's top leaders and politicians. Words are cheap. What's really needed is concrete action to emulate how Edhi cared for humanity. My hope is that the most selfish among Pakistanis will pause to assess their own lives and make a commitment to serve humanity as Edhi did. He was the most inspiring Pakistani for me. Lot of respect for him from India. AJ: "It will be tough to let go of so many years of hatred. But the day u see beyond it, u will realize its all such a waste. Instead try and love.... "
Criticism, including strong criticism, does not equal hatred. Edhi was often very strongly critical of many things in Pakistan, including its leaders and their policies, but he loved Pakistan. I frequently strongly criticize India and Pakistan but I do not hate the people in either country. My criticism is mostly directed at bad characters and policies in both countries. In God we trust; in the government, not. The Muslim holy month ends this weekend, and hey, happy Eid to everyone. Some people will be relieved. In the lead-up to it, many affluent people in Pakistan visit their bank and fill out a form asking to be exempted from having zakat, an Islamic charitable tax, deducted from their accounts. By law, during this period the government is entitled to collect zakat from people whose assets reach a minimum threshold, and place it in a welfare fund for the needy. In the same month of Ramzan — known as Ramadan in the Middle East — people give billions of rupees to various charities. Zakat may be a pillar of Islam, but Pakistanis just don’t like handing their money over to the state. In a country of about 200 million people only about half a million pay direct income tax, for example. Even Pakistanis who live in huge mansions, have four cars or spend a few million rupees on a wedding dress pay zero income tax. In God we trust; in the government, not. Plus, the government can always go to the International Monetary Fund. There is some merit to this view. In Pakistan, some of the most basic functions of the state are performed by charities. If you are poor and have an accident or a medical emergency, the ambulance that takes you to the hospital probably was sent by a charitable organization. If you can’t pay for your medicine, it’s a welfare trust at the hospital that may help you out. You might even get a kidney for free. If you live in a slum, your child might go to a school run by a bunch of do-gooders. If you are a daily wage laborer in the city, some nice folks will serve you a free lunch. If you see a wounded animal on the road, you can call a privately run shelter to pick it up. If you die, chances are that your body will end up in a morgue run by a charitable trust. Your ride to the graveyard will be in a vehicle donated by some god-fearing, and probably tax-dodging, dude. These charitable, god-fearing, tax-dodging souls become really generous in the holy month. During Ramzan, major Pakistani cities are overrun by beggars who travel from far-off rural areas to partake of the seasonal generosity. Only there is less and less to go around. Last year in Karachi, I came across a family of eight from a village in southern Pakistan crammed into a tiny air-conditioned A.T.M. booth. They were taking refuge from the oppressive heat. How is the month going, I asked? Nothing but food, I was told. Not even enough cash to cover the bus fare to go back to their village. In previous years, they had been able to take at least some cash home. The late Abdul Sattar Edhi, Pakistan’s most well-known philanthropist, who ran a countrywide network of ambulances, orphanages and shelters for abused women and unwanted babies, accepted donations from (almost) everyone. When he was short on cash, he would sit at a traffic signal, like a beggar, the hem of his shirt stretched out. People would come to him and give and give. Sometimes even beggars would stop by and throw their entire day’s earnings into Edhi’s lap. He used to say that it’s poor people who give the most. A millionaire who lays a spread for fellow Muslims breaking fast is making an investment in the afterlife. A poor man who digs into his pocket and gives away his last few rupees to another poor man is doing Allah’s work.